Above is the Chicago Bike Flag logo I had created for the IllinoisBicycleLaw.com Blog. The logo is obviously inspired by the Chicago flag, but instead of stars and stripes, this flag proudly has bike chains and bicycle cogs to represent Chicago's critical and unique bicycling culture. 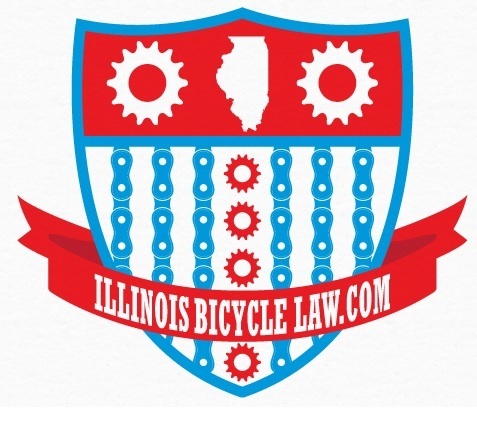 The Chicago Bicycle Flag is a Copyright/Trademark of Keating Law Offices, P.C. Reproductions are not allowed without express written permission of Keating Law Offices, P.C. The firm is the top firm in Illinois dedicated to representing bicyclists who have been injured as a result of the negligence of others. The firm's bicycle attorneys handle cases stemming from automobile versus bicycle collisions, doorings, intersection cases, product liability cases and premises liability cases. For more information about the Illinois Bicycle Lawyers at Keating Law Offices, P.C., please click this link to our information page on IllinoisBicycleLaw.com.